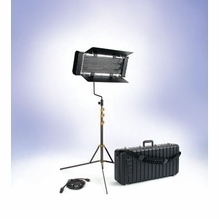 Fluorescent Light Kits: Soft, Energy Efficient Lighting for on Location and in Studio. Fluorescent lighting is a capable solution for many applications because it offers excellent energy efficiency as it draws very little power. Fluorescent lights are ideal for on-location shoots, as there is often limited electrical power available for running lights. The best part about fluorescent lighting is that you can change the color temperature from tungsten 3200K to daylight 5600K by changing the bulb(s). In contrast, tungsten or HMI lighting requires adding lighting gel to the fixture, which not only adds an additional expense but also reduces the light output. 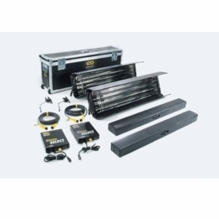 You'll find professional-grade Kino Flo fluorescent light kits and additional options at BarnDoor Lighting. Create soft lighting in film or on stage with fluorescent lighting kits that bring soft, shadow-less light. Fluorescents are also great for lighting chroma key green screens, and there are even green screen fluorescent lamps available for this purpose. These lights are used for many motion picture, TV commercial, corporate video and music video productions thanks to their versatility, energy efficiency and low heat production. 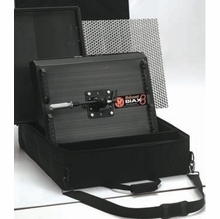 �BarnDoor Lighting offers Kino Flo fluorescent lighting for film and video as well as options by Arri, Mole-Richardson and Lowel. If you have any questions about fluorescent photo light kits, our expert team can help answer your questions via phone at 1-888-276-3667 or by e-mail at info@barndoorlighting.com.